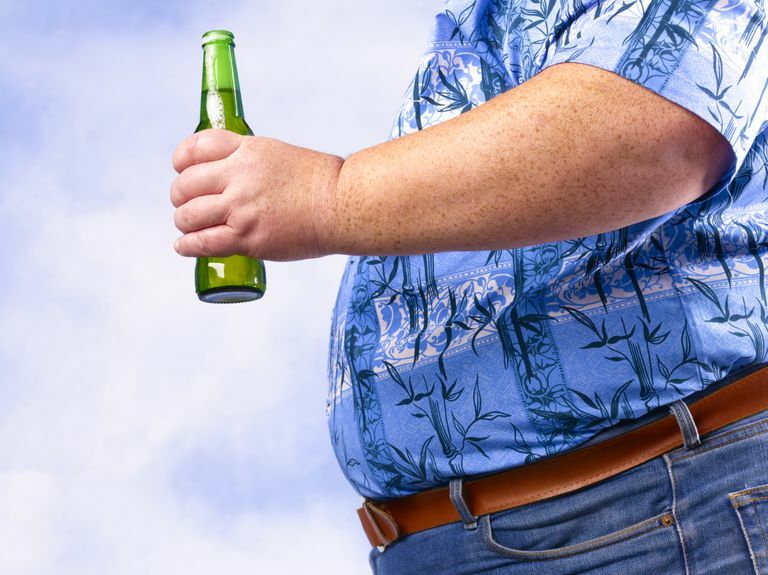 Is drinking alcohol linked to obesity? The answer is it is possible, although research on the association has produced inconsistent results. It may be that it's not how often you drink, but how much you drink when you do drink that affects weight gain. Some research suggests that it's your pattern of drinking that affects your body mass index (BMI). Body mass index (BMI) is the relationship of someone's weight to their height. It is calculated by dividing your weight in kilograms by your height in meters squared. A BMI measurement of 18.5 to 25 indicates normal weight; 25 to 30 is overweight; and over 30 is considered obese. A study of 37,000 drinkers who never smoked tobacco, found that BMI was linked to the number of drinks the subjects had on the days that they did drink. Because previous studies had linked smoking and drinking to weight gain, the NIAAA study looked at only those drinkers who had never smoked. "In our study, men and women who drank the smallest quantity of alcohol—one drink per drinking day—with the greatest frequency—three to seven days per week—had the lowest BMI's," said first author Rosalind A. Breslow, Ph.D., "while those who infrequently consumed the greatest quantity had the highest BMIs." Previous studies have not definitively linked alcohol consumption with weight gain. A systematic review of the literature on the subject found that cohort studies with long periods of follow-up produced contradictory results. Findings from short-term experimental trials also failed to show a clear trend regarding drinking and obesity. Overall, the review found, that research has not established a clear link between alcohol consumption and weight gain. But, studies that did positively link alcohol consumption with weight gain mainly involved higher levels of drinking. Breslow's study used a different method of assessing alcohol consumption compared to previous studies, she explained. "Alcohol consumption consists of two components," explained Dr. Breslow, "the amount consumed on drinking days (quantity), and how often drinking days occur (frequency). Previous studies generally examined drinking based only on average volume consumed over time. However, average volume provides a limited description of alcohol consumption as it does not account for drinking patterns. "For example, an average volume of 7 drinks per week could be achieved by consuming 1 drink each day or 7 drinks on a single day. Average volume may not fully explain important relations between quantity and frequency of drinking and health outcomes such as obesity." Breslow and her colleagues concluded that there may be several reasons that her study found a link between both quantity and frequency of alcohol consumption to BMI. "Alcohol is a significant source of calories, and drinking may stimulate eating, particularly in social settings," said Dr. Breslow. "However, calories in liquids may fail to trigger the physiologic mechanism that produces the feeling of fullness. It is possible that, in the long-term, frequent drinkers may compensate for energy derived from alcohol by eating less, but even infrequent alcohol-related overeating could lead to weight gain over time." Other studies have indicated that the type of alcohol consumed may be a factor in whether nor not drinkers experience weight gain. For example, light-to-moderate wine consumption has been found to protect against weight gain, while drinking spirits has been positively associated with weight gain. Additionally, common sense tells us that it's called a "beer belly" for a reason. So, what is the bottom line? Does drinking alcohol cause weight gain or not? Drink heavily when you do drink. Scientists agree that more studies are needed to determine if drinking patterns increase the risks for weight gain if certain types of alcohol are more likely to cause weight gain, and if the person's general tendency to gain weight regardless of their drinking is a factor when they do begin to drink. Breslow, RA, et al "Drinking Patterns and Body Mass Index in Never Smokers." American Journal of Epidemiology February 2005. Sayon-Orea, C, et al. "Alcohol consumption and body weight: a systematic review." Nutrition Reviews August 2011. The Calculator Site. "What Is Body Mass Index? How Is BMI Calculated?" Health July 2015.